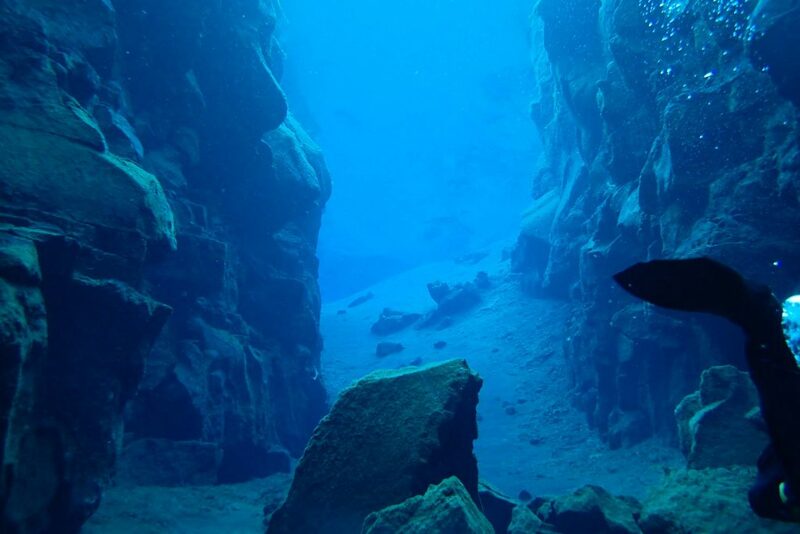 It was a month after booking a holiday in Iceland that it occurred to me – could I tick Silfra off my bucket list? 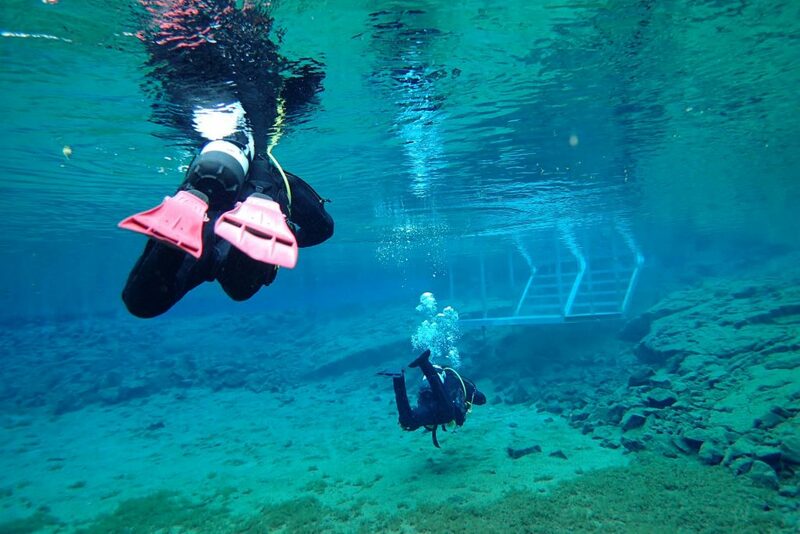 My wife and I had planned to spend two weeks driving around Iceland’s ring road in autumn 2018, and I reckoned I could tweak our itinerary to fit in a trip to Silfra. A Google search found several dive-tour companies and, based only on the clarity of their websites, I narrowed it down to one. However there were a few hoops to jump through before booking: there was a maximum age limit of 65, and even being over 60 was considered a medical condition! After phoning to explain that I’d had a lot of drysuit experience in cold British waters, the age limit was waived, but I still had to provide a doctor’s sign-off, and a signed statement from an instructor (thanks Simon!) confirming at least 10 drysuit dives in the past 2 years. The day finally arrived, and it was up at 6.30am, have breakfast, make sandwiches, scrape the ice off the windscreen and turn on the heated car seats. I had to be at Silfra for 9am, about an hour’s drive from where we were staying near Reykjavik. Although I had the post code for the meeting place, Icelandic post codes cover very large areas and are of little use for navigation. Instead I had to set the latitude and longitude into my satnav, which I’d never done before. Leaving Linda to enjoy a quiet day without me, I set off, allowing plenty of time and hoping that I hadn’t made any mistakes programming the satnav. 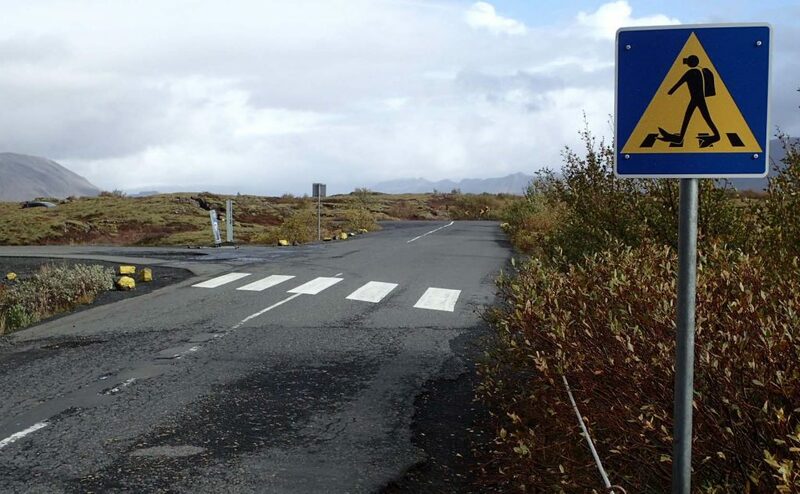 The road climbed slowly out of Reykjavik towards Þingvellir (pronounced Thingvellir) National Park, where Silfra is located. As we ascended, the increasing cold and frost was countered by a little warmth from the rising sun, so that on arrival it was still around 0Oc, with snow on the surrounding mountains. 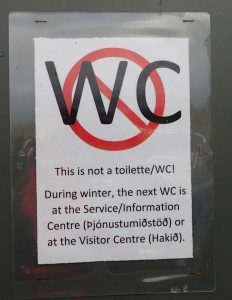 I found the visitor car park without any problem, however working out how to pay for the parking by internet was a little trickier (Iceland is almost cashless). 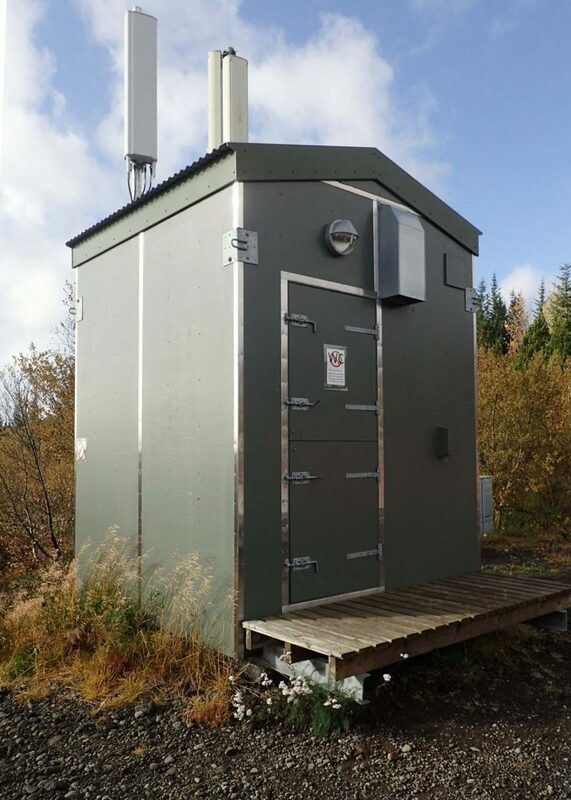 I then tried and failed to get into the car park WC, eventually realising that the “WC” was in fact the base of a mobile phone mast (The sign on the door was a clue). 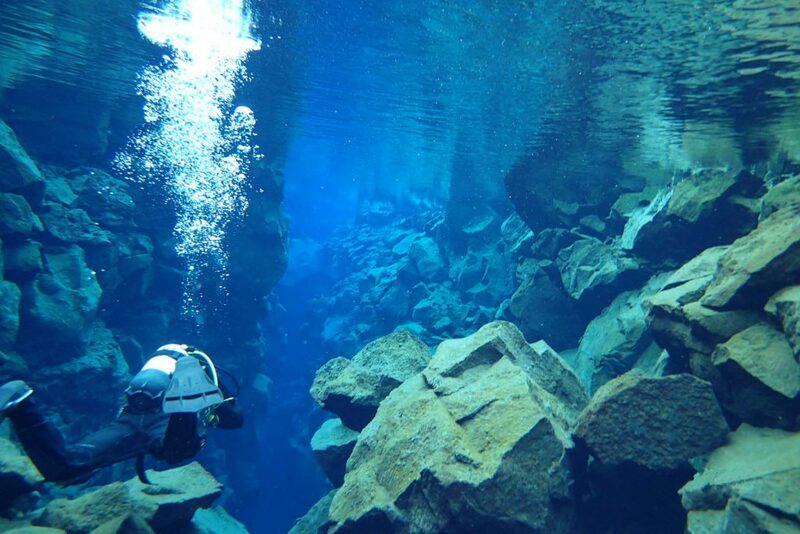 Silfra – with locations shown. I walked to the meeting point in the adjacent dive-van park, where a dozen vans and minibuses from various dive companies were setting up shop for the day. It was a hive of activity as people arrived, tried to find their dive-van, get documents checked and be kitted out with dive gear. I was diving with “Arctic Adventures” and met my guide Andy and my buddy-to-be John, who was from Texas. Andy told us that we would do one or two dives, depending on conditions and on how we felt after the first dive. I had read that the water temperature was around 4oc at its warmest, dropping to 2oc in winter. The coldest I had ever dived was 4oc at Capernwray; on that occasion I was frozen after only 30 minutes but could at least warm up between dives with a hot meal in the café. 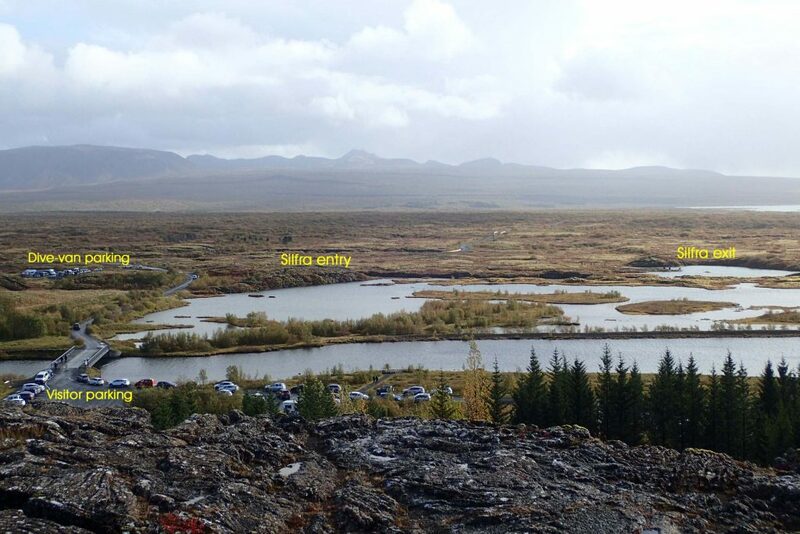 The park is located in an immense fissured rift valley, towards the northern end of the mid-Atlantic ridge. 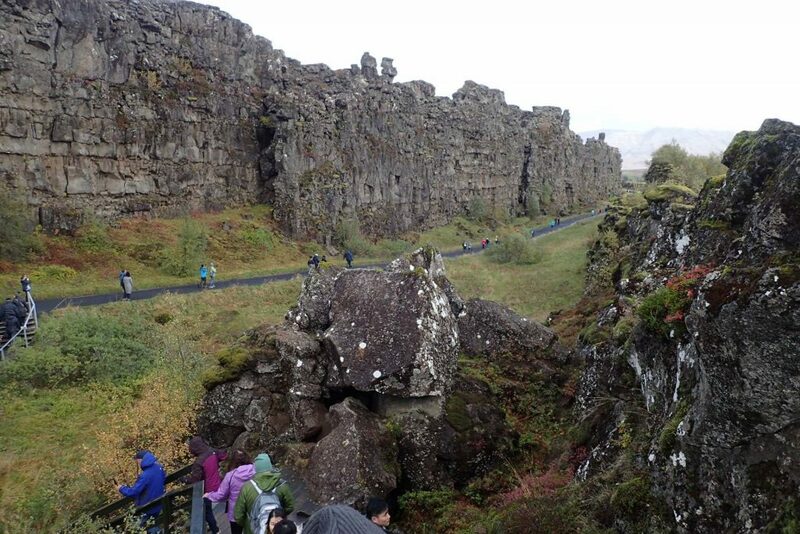 This ridge, and Iceland itself, forms at the junction of the North American and Eurasian tectonic plates. The plates are moving apart a couple of centimetres a year and there are obvious signs of this throughout the park; Silfra is just one of many fissures in the area. 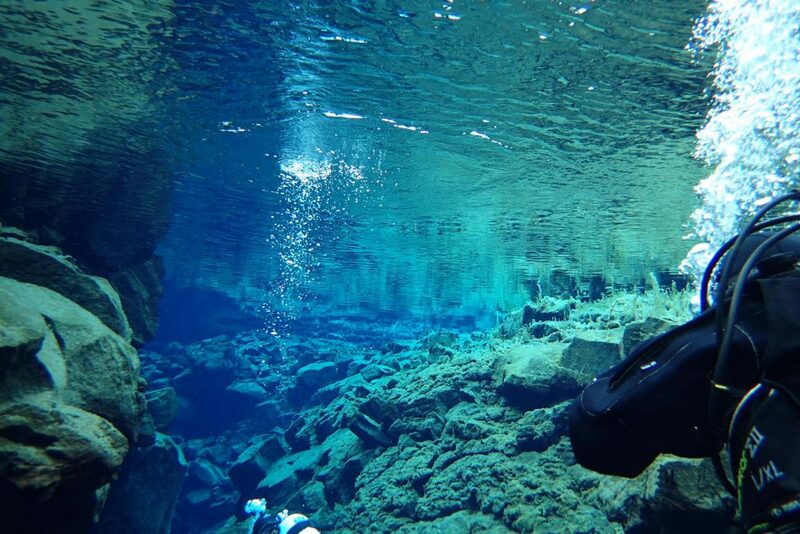 It was originally dry but an earthquake in 1789 opened up several more fissures and Silfra filled with water. 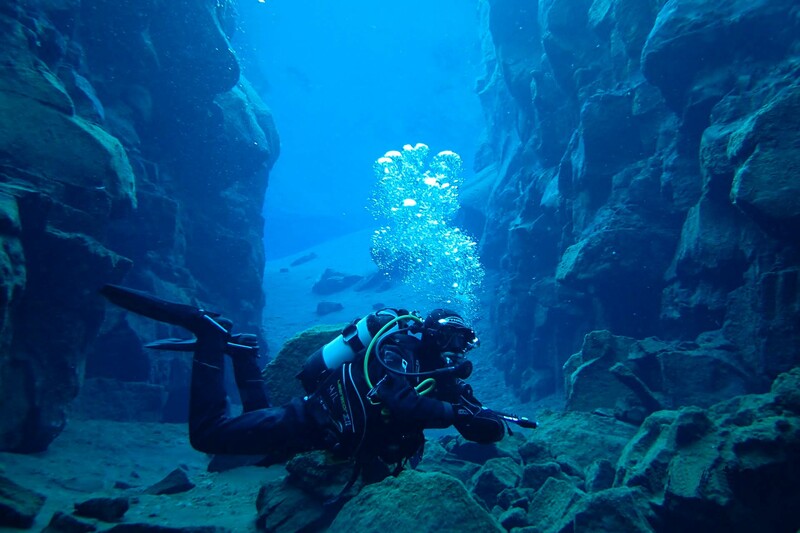 A gentle flow of water through Silfra empties into Þingvallavatn, the largest lake in Iceland, helping to keep the water clear. 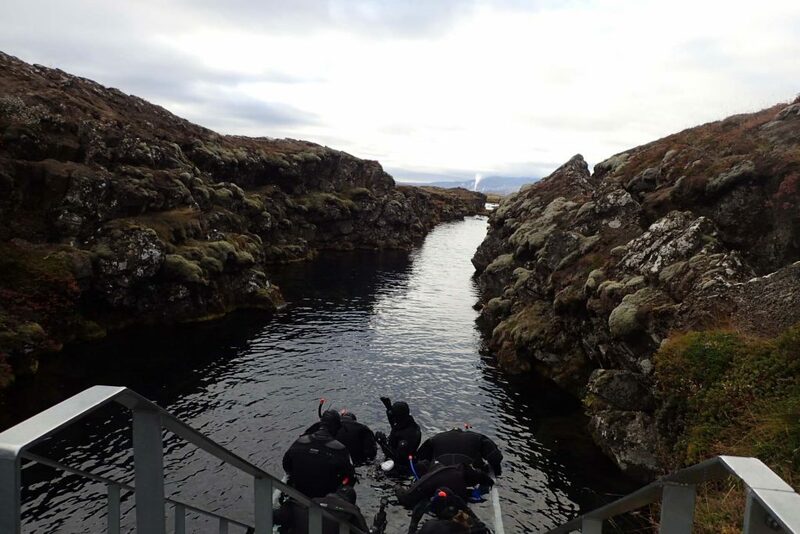 We were then briefed on the dive and got kitted up in the minibus – neoprene drysuit, a thick dense undersuit, 12 litre steel tank and weight harness. 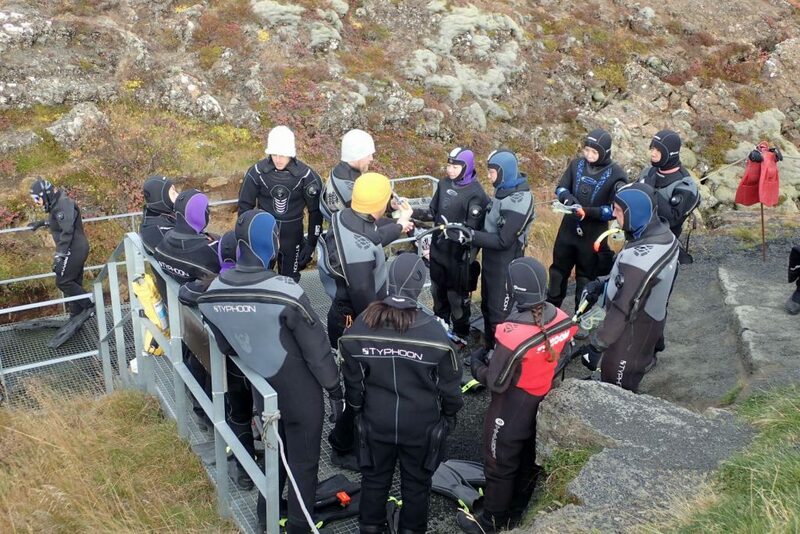 We walked in full kit about 150m to the Silfra entry point, on the way traversing a “divers crossing”. A wide set of metal steps led down into the water, however there was a long queue of others waiting to enter; a few divers but mostly large groups of snorkelers, so we waited our turn on the strategically placed benches. There was a lot of banter between the dive and snorkel guides, about which did the best souvenir hat / T-shirt / sweatshirt, and whether there was really any skill involved in snorkelling. Tourists wandered along to see what was going on, and were incredulous to see people going into the water in near freezing conditions. The park ranger frequently came past, doing his rounds of the various car parks and dive entry and exit points, to make sure that nobody was infringing park regulations. After half an hour it was our turn to descend the steps to the 1m deep entry platform. John and I had put 12kg in our weight harnesses before walking across, but we first did a weight check and found we needed another 4kg in our BCD pockets. I attempted to put some anti-misting agent in my mask, but Andy stopped me, explaining that it was not permitted to pollute the water with any chemicals, and that he could lose his job if the park ranger saw it! We were only allowed to use spit, but Andy suggested that before donning our masks we immerse our faces in the cold water for a few seconds – the theory being that there would be less evaporation from our frozen skin onto the inside of our masks – and this worked a treat. After a final warning not to descend below 18m or make contact with the bottom (it was silty in places) we dropped off the entry platform and had our first proper view: a rift between rocky sides about 5-10m wide, stretching ahead as far as we could see (about 90m), with a depth varying from 4 to 40m. Looking into the distance everything was an intense blue. The rift sides were sheer vertical rock faces in places, plunging down out of sight. In other places the bottom was a jumble of large tumbled-down boulders, sometimes rising up to only a few metres deep. At first there seemed to be no life at all, but later I noticed a translucent pale-green jelly-like algae covering many of the rocks. There are four sections to the fissure: the deep Silfra Crack where you can have your photograph taken “between the continents” (this is symbolic rather than real, since there are many fissures in the area and there is no single definitive east-west divide), Silfra Hall, the 100m long Silfra Cathedral, and Silfra Lagoon. The sun had come out by the time we entered the water; the water was so clear, and the reflections off the underside of the water were so bright, that it was quite a confusing underwater scene and difficult to judge your depth. I sometimes found myself breaking the surface when I thought I was much deeper. Parts of the main fissure were only wide enough to swim in single file. Andy led us through the fissure, the hall, over some rocky outcrops and into the Cathedral which had a sloping sandy floor at the far end. At the top of the sandy rise we had to turn sharp left into a shallower side passage. As the fissure narrowed at the turning point, the flow of water which had been gently helping us along became much stronger, and we had been warned to turn quickly to avoid being carried beyond. The side passage was very shallow in places, and sometimes we were scrambling along the bottom with our heads at the surface. 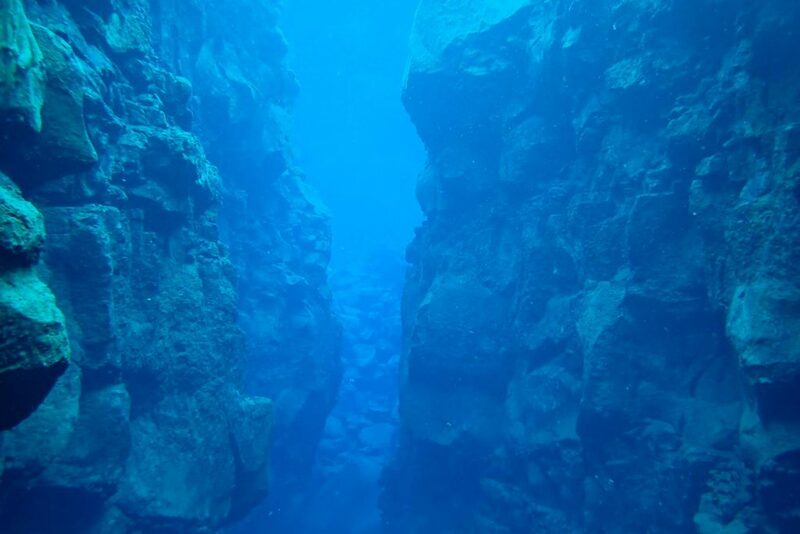 The passage led to the large but shallow Silfra lagoon. 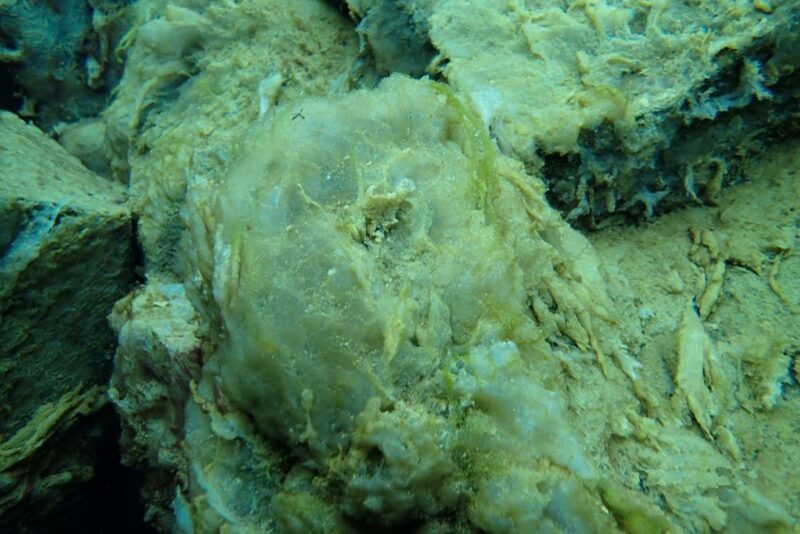 Here the jelly-green algae was replaced by a darker green stringy algae, known as “troll’s hair”. On reaching down to touch the bottom I was startled to find that it was very spongy and my arm went in over a foot without hitting anything solid. The side of the lagoon where we entered was only about 3m deep, shelving down abruptly on the far side to about 5m. We circled the lagoon and then made our way to the exit point – another metal platform about 1m deep with wide metal steps leading up. This first dive had lasted 50 minutes and been a constant 4oc. I was surprised not to be feeling cold and gave credit to the excellent neoprene drysuit and the thick undersuit. From the exit it was a 400m walk back to the car park. Still laden with full kit and weights, I was exhausted by the time we got back! John and I were happy to proceed with a second dive but first we had a 90 minute break, during which we changed tanks, ate our sandwiches and were supplied with copious quantities of hot chocolate and bananas. (Fruit and most fresh produce are very expensive in Iceland, but for some reason bananas are cheap). John also changed his BCD as it had been leaking slightly. Half way through the break it began to snow and although we had been warm enough at the end of the first dive, we had to pace around the car park to keep warm. Our second dive was to be pretty much a rerun of the first, except that when we reached the lagoon we were to head straight for the exit rather than circumnavigating it, so that it would be shorter than the first. John and I both left our cameras behind so that we could just relax and enjoy the dive. Once again we had a long wait for a group of snorkelers before we could enter the water, and were caught in a hail storm while we waited. After entering we were immediately followed by a group of 3 military divers, who rapidly caught up and overtook us, as if on some urgent mission! I’d had a buoyancy issue on the first dive, and only now realised that my inflator valve had a slight leak, so that my BCD was slowly inflating. Once aware of this I simply dumped air from my BCD every minute or so and had no more problems. The second dive lasted 30 minutes, after which it was back to the carpark for more hot chocolate and unlimited banana refills. Remembering the strenuous return walk after the first dive, I had dropped my BCD on exit and went back for it afterwards. 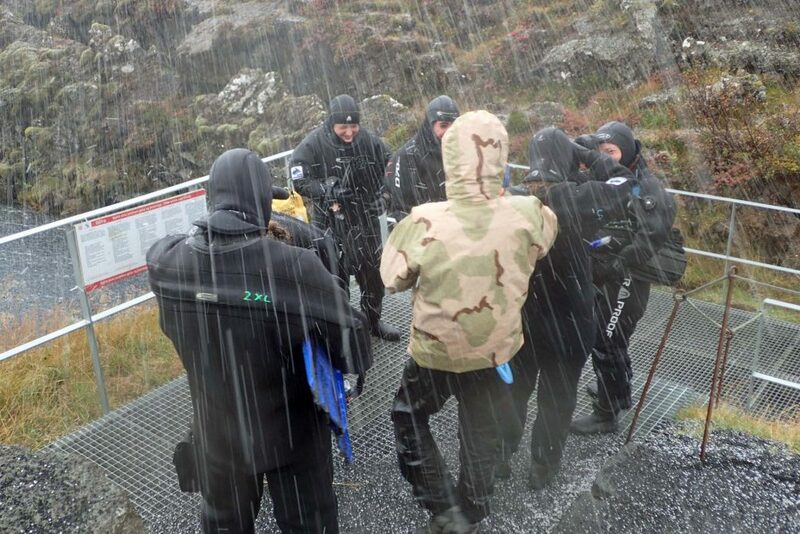 By now the snow had changed to rain and hail, so we changed out of our diving kit in the minibus, had our dive logs stamped and departed. There were still a few of hours of daylight left so I took the opportunity to look around the national park. 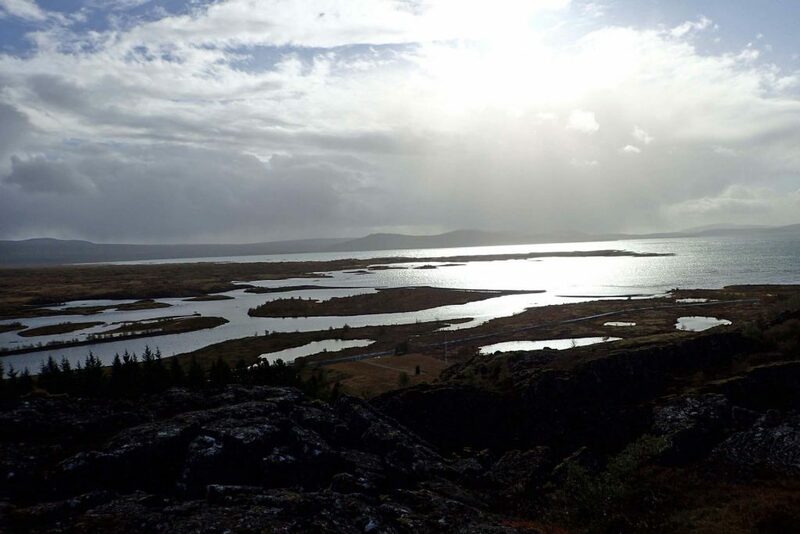 Walking uphill from Silfra along a wide rift took me to a visitor centre and viewing platform which gave a tremendous view over Þingvallavatn. 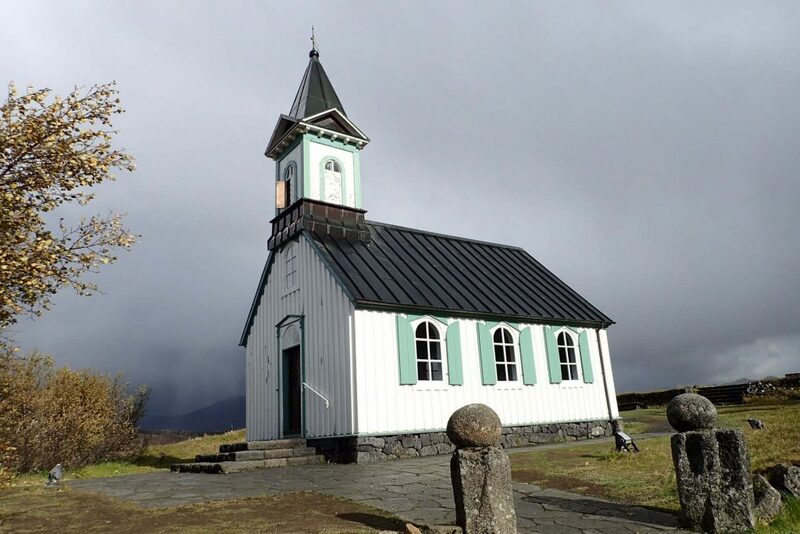 About a kilometre away is the site of the original Icelandic parliament, the “AlÞingi”. It was founded by the Vikings in 930 A.D. and is the earliest parliament in the world. Sessions continued there until the 1800’s when it moved to Reykjavik. Nearby are walking trails, rivers, waterfalls and an old wooden church. Finally I returned to the car to set off back. I intended to stop at the dive-van park in order to buy a souvenir T-shirt, however had reckoned without the park ranger! He would allow no visitor parking under any circumstances; so – been there, ain’t got the T-shirt. 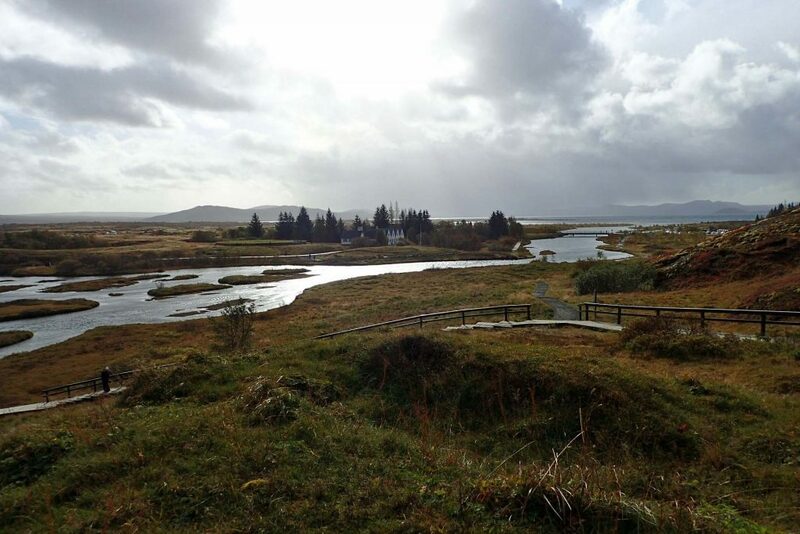 We flew with EasyJet from Edinburgh to Reykjavik (Keflavik) airport, about £125 each return. Wow Air also flies there from Edinburgh. 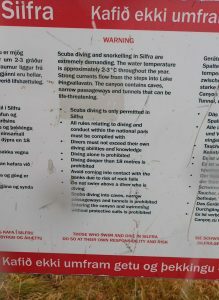 Diving at Silfra is strictly controlled and must be with a recognised dive guide. There are several tour companies offering guided diving. The diving and prices are all pretty much the same whoever you go with – cost about £250 including all equipment (except for socks and base layer). 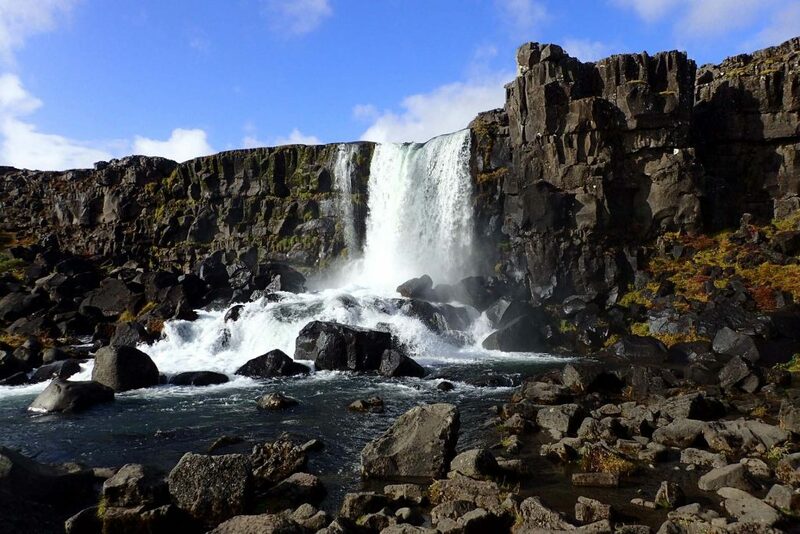 The price also includes pick-up from some central Reykjavik hotels, although there is no discount if you travel to Silfra yourself. Iceland has a very low density population. It has about half the land area of Great Britain, but only 170th the population (~350,000), two thirds of whom live in the Reykjavik area.  Although flights, car hire and fuel prices are reasonable, it is otherwise quite an expensive place to visit and we self-catered as much as possible. It is a beautiful scenic country, with many opportunities for winter sports (not necessarily in winter! ), natural thermal pools, whale watching, and is well worth a visit.